It was a regular day at the sea, where pirates were working on their ship, scurrying about, yelling things to each other. On this ship, also worked a Kacheek as the ship's cook. He would make food for the hungry pirates day after day, up to three or four times a day, depending on how hungry the pirates were. Every pirate knew him and loved his food, all of Krawk Island treasured the things he made. He loved his job, he loved making different kinds of foods, but most of all things, he liked to bake. The Kacheek would bake intricate cookies and pies and cakes that would look like delicate flowers and tasted so heavenly, some pirates thought he cooked with faerie magic. Pirates preferred other kinds of food, sadly. They wanted their slop and meat, potatoes and different fruit grogs. The Kacheek felt like his talent is wasted on the ship and felt like he needed a change. After another exhausting day as the ship's cook, the Kacheek (also known as Breaddy), figured it would be the last day as a cook on the pirate ship. He decided to try out something different as soon as the ship would sail back to Krawk Island. He was born in Krawk Island and it had been his home for years. He couldn't even dream of living somewhere else, even though he disliked the pirate ways of life. He loved all of his crewmates, though, and couldn't really part with them. They had been his friends for such a long time and loved him as their cook. But a decision had been made and he needed to do this, to improve himself and really use his talent. Luckily for him, the ship sailed to Krawk Island the next day and it was time to leave the ship. Saying goodbye to all of his friends was hard, they told him to remember them, and they promised to come see him wherever he went and whatever he tried. Most of them understood his need to try out something different, but some were not as understandable. "So you think the ship life ain't for ya, mate?" one of the crewmembers asked him. "Nah, he just thinks he's better than us, yarr," another one added. "Guys, guys. You're all dear to me, but I just need to try this out for myself. I don't feel like I am giving it my all, here." The Kacheek sighed. "We'll miss ya cooking, scallywad." The first one told him. "Good riddance!" the other one added, giving him the stink eye and limping away on his wooden leg. The Kacheek sighed and walked onto the land. He had heard the Food Club was looking for a cook, to cook enormous amounts of food every day, for the pirates to eat. He hadn't heard much of Food Club, but since it was on land, he decided to make his way there and try it out. "Hello matey!" he heard, as soon as he walked through the Food Club gate. It was another blue Kacheek . Given, he was older than Breaddy here, but they looked alike, nevertheless. "Are ya here to bet?" the older Kacheek asked him. "I'm actually here, because I heard there might be a job opening in your kitchen." Breaddy told him. "So yer here for the job, ey?" The old Kacheek looked curious. "Well, let me show ya the kitchen, then." He put out a "closed" sign and took Breaddy to the Food Club's kitchen. 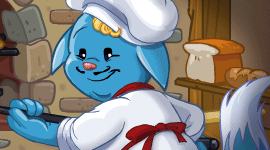 There were neopets running around in full sweat there, trying to cook up everything at once. "HURRY! It's about to start!" One Zafara yelled to the chia that was behind a counter, chopping carrots. "Oh, great! Reinforcements!" the Zafara shouted as soon as he saw the older Kacheek bring in Breaddy. "Great, great. Come over here and start peeling the potatoes!" The Zafara instructed. "We don't have much time left!" Breaddy did as he was told and quickly started peeling the potatoes. He did the best he could, but saw that this job was like his last one, on the pirate ship, but a lot more stressful, because there was much more food to be made in a shorter period of time. He realised this wasn't for him, as he wanted to take his time, making each food an art item on its own. Working on details, without being rushed. He stayed around until that round of Food Club had ended and the pirates were stuffed, helped to clean up, after which he said his goodbyes to his new friends and set out to find this job he dreamed of doing. Breaddy decided to head out to Neopia Central to start his quest for baking. Maybe there were neopets there that could help him find what he was looking for. It took him some time to reach Neopia Central, but when he got there, it looked wonderful. Neopets looked happy and the marketplace was filled with chatter and shoppers running around from shop to shop, baskets in their hand slowly filling with all kinds of items you could dream of. Breaddy walked around Neopia Central and didn't know where to go first. Everything looked so welcoming. Somehow he had already reached Neopian Bazaar, where there were even more shops to visit. He stopped in front of a house that looked like it was made out of gingerbread. This caught his attention, because it reminded him of something he himself would like to bake. He wanted to step inside this gingerbread house, but the door was locked. Then he noticed a small piece of paper, which read "For more info, check the food shop". And so he did. He walked back to the Food Shop with his curiosity peaked. "Hello and welcome to Food Shop!" he heard someone say. It was a yellow chia, greeting him. "Can I interest you in any apples today? We have bitten ones, and regular ones!" the chia continued. "I'm actually here because of that Gingerbread house, in Neopian Bazaar." Breaddy looked at the chia curiously. "Ooh, yes... The old bakery store. It's not running currently, because our former baker moved to Faerieland now that's on ground." the chia said. "I'd like to try and be your baker." the Kacheek said hopefully. "You want to become our baker?" the chia asked him with pure interest. "Okay. How about you bake something as a testing batch. So I could see your skills. Then we can talk about the Bakery." The chia said, eyeing the Kacheek from top to bottom. "Sure, I'd love to." Breaddy replied. The chia guided him into the back room, showed him where things were and gave him an hour to bake something delicious. Breaddy let his imagination run wild, he had fun whipping the neggs with milk and flour, he played with the colors resulting in the most beautiful cookies he had ever made. Each more intricate and detailed than the other. He left those to cool and wanted to bake a cake as well, since he still had time and there were so many ingredients here. So many ideas popped into his head, the ideas of cakes and delicious pies, interesting flavors he wanted to mix. But he stopped, seeing that the chia had been watching him. He didn't know how long he had been standing there, just watching. The chia looked amazed. "You....This...." the chia stuttered. "This is the best baking I have ever seen!" he managed to say. "Um.. Thank you." now Breaddy was lost for words. "You're hired!" the chia cheered. "Let's go look for the keys so you can start cleaning up the old Bakery and make it your own! I can't wait to see what you come up with!" the chia said pulling the awestruck Kacheek behind him. Breaddy was finally happy. He could feel this was the start of his new and improved life, where his talent was not wasted, but rather shared. He felt like this was a dream come true and he was eager to see what kind of delicious baked goods he could come up with. From that day on, Breaddy was known as The Breadmaster who keeps the Bakery going with his amazing baked treats, everyone knows and loves.